Pinot's Palette- Red Bank, Red Bank : Paint Party at the Proving Ground! Pinot's Palette- Red Bank - Paint Party at the Proving Ground! Join us as we paint at the Proving Ground in the Highlands! 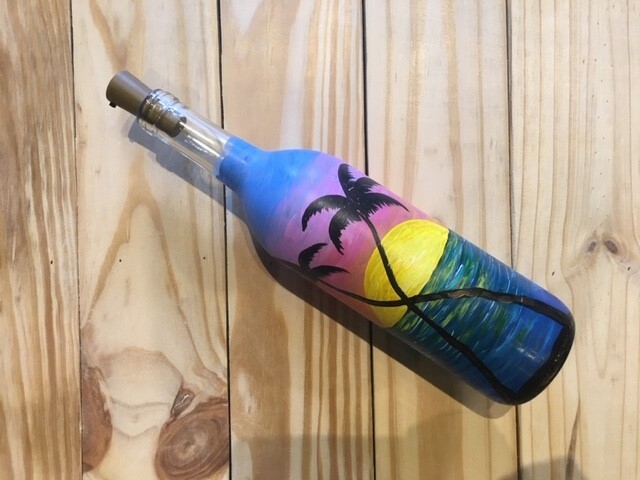 We will be creating this beautiful beachy wine bottle with light up cork! The cost of your reservation gets you all the painting supplies needed for the event! The Proving Ground will be running amazing drink and appetizer specials for all participating guests! Due to the custom nature of ALL of our classes, NO REFUNDS will be issued for reservations! However, if you cancel with at least 48 hours’ notice (14 business days’ notice is required for cancellation of private event reservations) your payment will be turned into a store credit that can ONLY be used for a future class. Please email us at redbank@pinotspalette.com to cancel. If you no-show for a class that you have a spot reserved or don't give at least 48 hours’ notice, you forfeit your reservation payment. By completing the check-out process, you agreed to this policy. Pinot's Palette is the upscale paint & sip destination in Red Bank where anyone can be a Picasso. No art experience required! Join us for a fun night out of painting, music and friends! In two or three hours, you can create a festive painting by following our artists' directions at the front of class, or you can Be Bold and create your own masterpiece! We have public group classes or you can book a private party with us for any occasion - bachelorette party, birthday parties for kids and adults, class trips, fundraisers, team building and MORE! We also sell gift certificates - you can buy online or in the studio. They make the perfect gift for anyone looking for a fun experience!